Among the rolling hills adjacent to a nature preserve in St. Joseph Minnesota is Milk & Honey Ciders. Their latest crisp and balanced cider is “Solar Sweet Farm Cider”, a collaboration with the beekeepers at Bare Honey which tend a busy family of happy honey bees on the solar farm adjacent to the cidery. 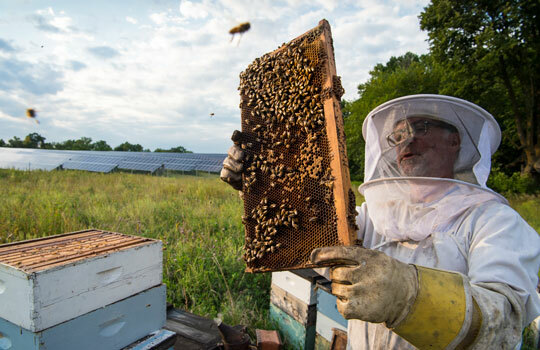 IPS Solar and nonprofit Fresh Energy helped make the connection between the beekeepers and the cidery. 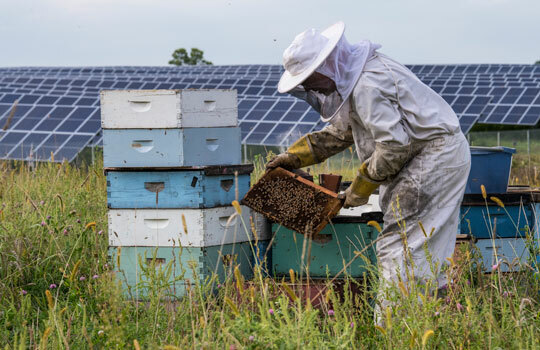 IPS develops all of its solar farms to have abundant pollinator habitat. Project Manager for IPS and former ASES Board Member Laura Cina says “I think all of the old school solar installers are really just big hippies at heart, so if it costs a little extra to plant vegetation that will boost biodiversity, prevent erosion, help save the pollinators, than that’s what we’re going to do.” Fresh Energy is the nation’s leading nonprofit group highlighting the opportunity for solar farms to provide beneficial habitat for pollinators including bees and butterflies. Minnesota Native Landscapes manages the flowers and vegetation at the solar farm. Acclaimed restaurateur and two-time James Beard award semifinalist, Kim Bartmann is excited to highlight this delicious collaboration at her restaurants in Minneapolis just in time to celebrate all the work that pollinators did earlier this year in apple orchards throughout Minnesota. “Solar Sweet Farm Cider” — Golden Russet & Kingston Black apples with honey harvested from the solar farm adjacent to the cidery. Tropical fruit notes from the Golden Russet and herbal spice from the Kingston Black, earthy & sweetness from the honey. 8% abv. The Walz Family farmed this land for decades but when the patriarch farmers of the family passed away the younger generation looked for ways to keep the land in the family. They quickly discovered that leasing the land to a solar garden was more profitable than leasing to another farmer. Additionally, the environmental benefits for the land and surrounding community was a very attractive proposition. This entry was posted in Community Solar, IPS Solar and tagged Community Solar, IPS Solar, Solar Honey Cider on October 8, 2018 by Kyle Wehnes.